The canvas was born under the brush of Edward Manet in 1874. Today it is stored in New York in the famous Metropolitan Museum of Art. On the canvas, we can see a girl, quite a young age and a man. They are comfortably seated in a boat with a sail. The man is dressed in the latest fashion, it kanote. He crouched aft, the boat controls with his left hand. The young girl allowed herself to lie down a little while leaning on the edge of the sailing boat. The artist built the composition in such a way that all the figures on it were as close as possible to the viewer. Manet decided to leave the boat outside the picture. We are available for review only a small part of the back of the boat and just a little sail. This creates the illusion of presence in the boat. The background of the piece is water, a very beautiful color. She is practically blue, slightly playing with emerald bursts. Manet used a light color scheme that helped him transmit the air, his freshness. The artist managed to show us the real transparency of the air. The canvas is written in the style of impressionism. This style can transmit the feeling of movement. At the same time, the artist does not forget to emphasize how people and silhouettes depicted by him are one with the environment. Critics, art historians who explored the life and work of Manet believe that the painter depicted the helmsman of his relative, Rodolph Leenhoff. We are not completely sure who was the prototype for the girl portrayed by the painter, but there are guesses and versions that this is Claude Monet’s wife, who was the first, Camilla Donsier. 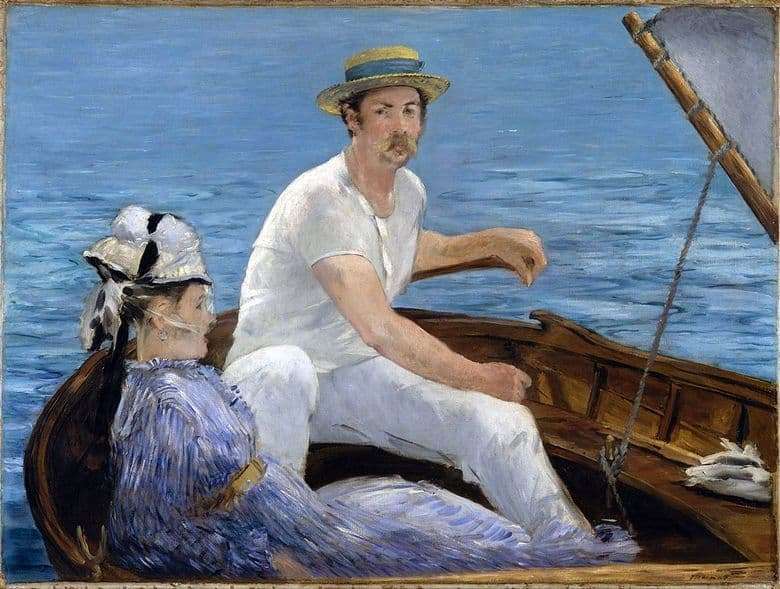 Art critics believe that the work “In the boat” by Manet is one of the most important words in art. Looking at the canvas, we can feel the light breeze. It creates a feeling of presence, joy and freshness.